Follow the potato package instructions to bake them. In the meantime, bring a small pan of water to a boil, and cook the fresh fava beans for 2 minutes. Add the corn and keep cooking for 3 more minutes. Drain and peel the fava beans. When the potatoes are ready, let them cool, and then mix the rest of the ingredients in a bowl. You can skip the red hot chili pepper if you're not into spicy food. You can use red wine vinegar or even apple cider vinegar instead of white wine vinegar to make this salad. Instead of queso fresco, you can use feta cheese. If you want to make this a more robust salad, add quinoa. Solterito is a typical salad from the Andean region of Arequipa, in Peru. It is made with fresh fava beans, rocoto (a very hot local chili pepper), queso fresco, and Peruvian giant kernel corn. 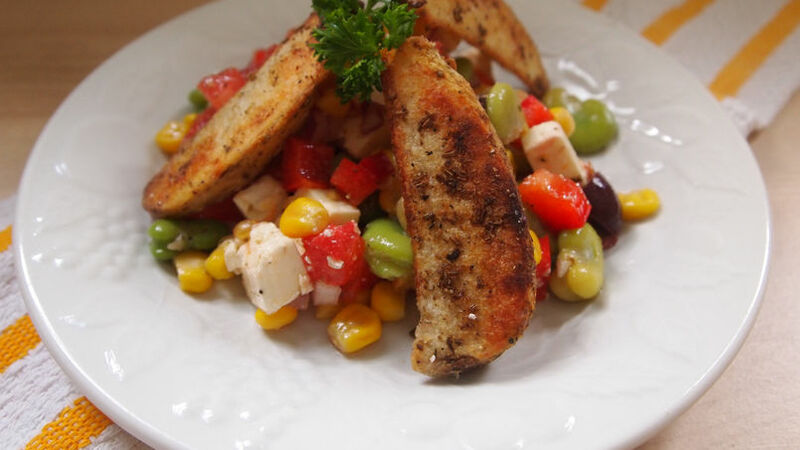 The combination of flavors and textures in this summer salad work so well that even those who are not big salad eaters are easily seduced by it! Living abroad, I usually make my own version of solterito, using any corn I can find, and replacing the rocoto with regular red hot chili peppers. If I can't find fresh fava beans, I sometimes use frozen edamame or baby lima beans. Add it to your list of cold salad recipes and you will always have a delicious meal to eat.